This me me me installation consists of three computers and three monitors mounted to the wall side by side. 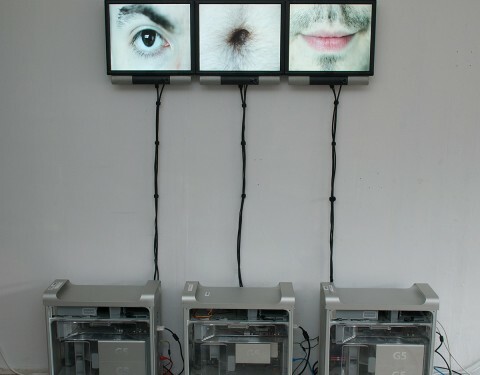 Three videos play on the screens and are synced by MaxMSP software. The work explores the ego and the world of the mind juxtaposed by the fragility and crude nature of the human body. While we constantly strive to fulfill our desires, our bodies exist in a state of constant flux, slowly dissolving over time. 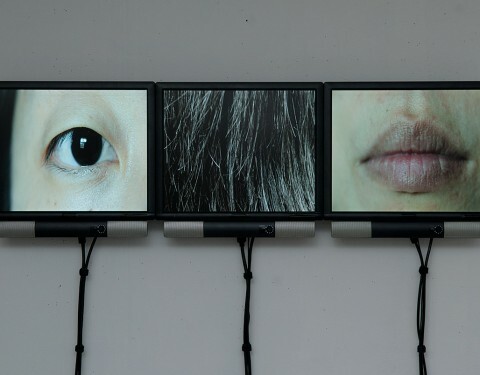 Above is a composite video of the three different video screens from the installation merged into one video for web viewing. 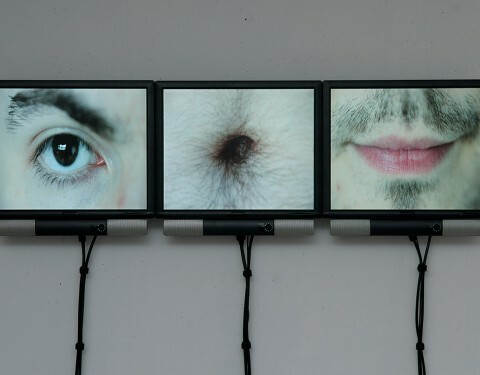 Each monitor shows three different views of a persons body intermixed with their mouths saying “me”. The images linger only moments before changing to different views. One of the ideas in this piece, along with much of my work, is the fracturing of consciousness into computers and other electronic and biological devices. The models are abstracted into parts and recorded in very unflattering ways revealing the details of their fragile bodies. The computers in the installation are also exposed, showing their inner workings and all the small delicate parts that make everything work. The work is about bringing the inside out, desires, emotions and also the mechanics of the machine revealed. Each of the models say “me” and at a certain point another model’s mouth appears saying “no” and then the new model begins to take over the screens. We are driven by our fractured desires for attention and acknowledgement. We are the ghosts in the machines of our minds and bodies, now transposed as a series of afterglows into living electromechanical devices.